I’ve been on the road since August and couldn’t be happier with the choice of camera gear / equipment I’ve packed. Back in 2014 when I switched from a Canon 1D and range of heavy lenses my goal was to reduce the weight of my camera gear to under 10Kg (22lb) as I knew I was going to be travelling for a long period in 2015. To further reduce the weight of my equipment I also switched from a fully upgraded 15″ MacBook Pro to the newer 12″ MacBook and and managed to halve the weight of laptop / accessory gear in my bag. As a surf photographer I will always have a housing and a range of ports in the packlist. This is probably the only piece of equipment where I didn’t lose very much weight over my previous setup (Aquatech Imaging Solutions). The Olympus housing is a dive housing and is therefore built a lot more robust (and heavier) than Aquatech housings. However, the housing and ports are MUCH smaller and I can fit this part of my gear into the tiny small pro F-Stop Gear ICU. I’m hoping to add the M.Zuiko 7-14mm f/2.8 PRO to the list in 2016 to complete my M.Zuiko PRO lens lineup, since my photography has evolved and I feel that a landscape lens will come in handy. 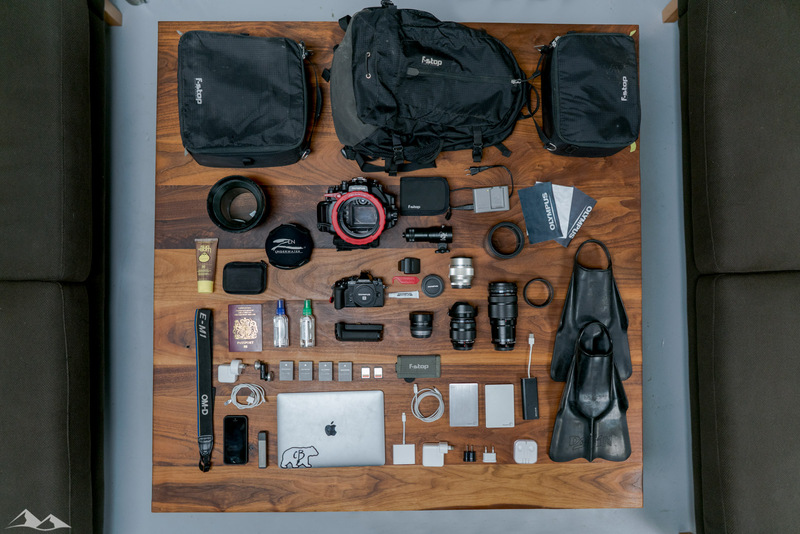 Over the months of travelling and working with Chris Burkard there obviously have been slight changes / optimisations, but in general I’d say this is probably the perfect packlist for my needs.